NEW YORK, Sep 11, 2012/ — On the eve of New York Fashion Week, the glitterati and style elite came out to celebrate Angelo Galasso POLSO OROLOGIO at the designer’s flagship boutique at the Plaza Hotel. With Penn Bagdley who was wearing an Angelo Galasso Caputti Shirt and Blazer, as guest of honor, Angelo and Carlotta Galasso welcomed Theopilus London (wearing an Angelo Galasso Blazer, Hat and Belt) and Mike Woodson (wearing an Angelo Galasso Polso Orologio Shirt and Blazer) to the gala event. The theme of the evening showcased his iconic Watch Cuff Shirt (Polso Orologio) – a signature staple in his collection. The Polso Orologio shirt allows you to wear your chronograph proudly. JACOB & Co is providing watches to be displayed and worn with the Polso Orologio shirt. Joining Angelo Galasso, Penn Badgley, Sean Avery and Theopilus London were NY Knicks Head Coach Mike Woodson, Allan Houston, and Gloria Govan. 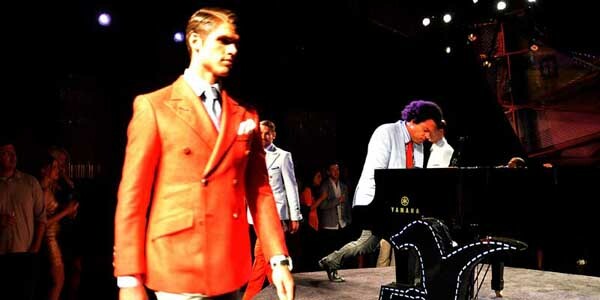 Rock jazz pianist ELEW held a private concert for the guests and also provided live music during the fashion show.